Take 42% off the entire book. Just enter code slcurcic into the discount code box at checkout at manning.com. 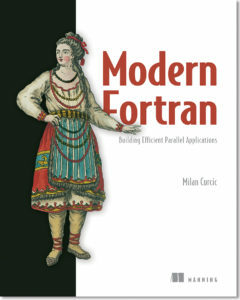 Modern Fortran: Building Efficient Parallel Applications teaches you how to develop fast, efficient parallel applications with Fortran. To warm up, you’ll start by building a simple application in modern Fortran, with a focus on reusable modules, functions, and subroutines. 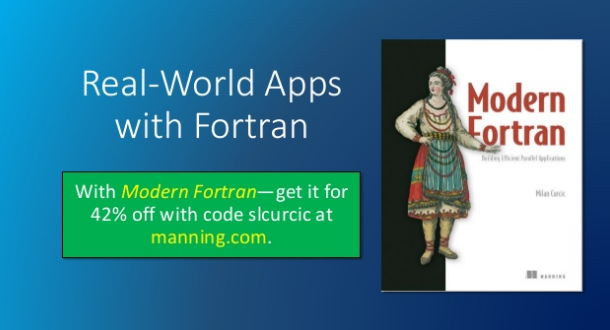 Next, you’ll dive into Fortran’s unique approach to parallel programming with coarrays. As you work through this practical guide, you’ll systematically explore all the really interesting stuff: how to overload operators and generic functions, work with a variety of different inputs and outputs, and much more. Finally, you’ll take on advanced parallelism with teams and events, interoperability with C, and even publishing your finished app. Learn more in the slide deck below.